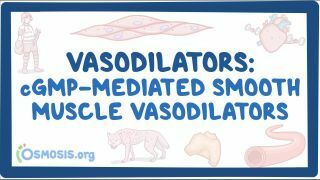 Osmosis: Vasodilators: cGMP mediated smooth muscle vasodilators. (2019, April 20). Retrieved from (https://www.osmosis.org/learn/Vasodilators:_cGMP_mediated_smooth_muscle_vasodilators). Nitroglycerin belongs to a group of drugs called nitrates. These agents all exert their effect by being converted to nitric oxide in the body by mitochondrial aldehyde dehydrogenase. Nitric oxide is a potent natural vasodilator. Clinically, nitroglycerin is used as a medicine for angina pectoris, acute coronary syndrome, and pulmonary edema. Sodium nitroprusside is a short-acting vasodilator primarily used in hypertensive emergencies. It exerts its effects by increasing cyclic guanosine monophosphate via direct release of nitric oxide. Its main adverse effect is cyanide toxicity. Isosorbide mononitrate is a drug used principally in the treatment of angina pectoris and acts by dilating the blood vessels so as to reduce the blood pressure. It is sold in the USA by Kremers Urban under the trade name Monoket, also sold in the USA under the name Imdur, and marketed in the UK under the trade names: Monosorb, Chemydur. In India, this drug is available under the brand names of Ismo, Isonorm, Monotrate, Solotrate, and Monit. In Russia it is occasionally used under the brand names Monocinque and Pektrol. Cyanide toxicity is associated with high doses of the vasodilator . A 62-year-old female with hypertension develops drug-induced lupus secondary to hydralazine therapy. You take a biopsy of a lesion on her face and send it to pathology. Which of the following histopathologic findings in the basal layer of the epidermis is consistent with this diagnosis?